The55thFx Review 2018 | Is The55thFx a Scam or Legit Forex Broker? Beware The55thFx is a Non-Regulated broker. It is NOT SAFE to trade. The55thFx is a broker that offers trading in Forex, binary options and cryptocurrency. The broker doesn’t disclose much information about the company behind the brand’s name, only that it is owned and operated by the55thFx Limited and located in California, USA. According to the website, the55thFx Limited is licensed and regulated by the Cyprus Securities and Exchange Commission (CySEC) under license number 278/07. However, there is no record of this company or license number in regulator’s register. It seems like broker’s regulation details are false, which puts clients’ investments into a high risk. It is not only because the broker lacks of regulation, but also because false regulation claims usually mean the broker is a fraud. 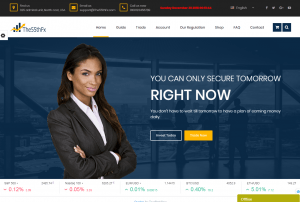 In addition, ESMA has prohibited binary options trading throughout Europe and the EEA, so those brokers who still offer binary trading can be considered as oure scam. We always try to remond traders to select a well-regulated forex broker to deal with. There are many such financial services providers that are licensed and have proved to be reliable. For example, those companies authorized by the UK’s Financial Conduct Authority or the Cyprus Securities and Exchange Commission.